I love the idea of chapbooks. Those small, cheap pamphlet-type books that are produced purely because the writer just wanted to get their work out there. Because they felt they had something important to say, or they wanted to express themselves through poetry or prose, or to record some part of their family’s history or values. Those writers very bravely put their work out for people to read without thinking (much!) of the bigger picture, of getting an agent or a publisher or what happens if people don’t like it. There’s a whole lot of discussion at the minute around e-publishing and self-publishing and should you hold out for a deal or do you do it for the money or the recognition, or do you just want to say something. I think, personally, and I doubt I’m very original here, that this is the age of the ebook, and it’s the perfect medium for a chapbook. People have short time spans available in the pressures of the modern world – even people who don’t ‘work’ like me but care full time for children or other loved ones. At the same time the explosion of the kindle, smartphone and ever-cheaper ereaders means that there’s huge potential for buying cheap publications and carrying them round easily for those moments when you do have some precious leisure time to read. I know, for example, that there’s a massive market for iPhone reading apps, whether it’s the classics, the kindle app or iBooks; I’ve had my own little bit of success with Ether Books who produce specifically for the iPhone (branching into other smartphone operating systems later in the year – hint hint) and who published my short story a couple of weeks ago. Without knowing the specific numbers involved, I know it’s been popular because my story has been in the Bestseller list since it was published (ok, bragging over now). That small success has given me a much-needed boost. Family upheaval lately has meant that my writing has very much taken a back seat and I’ve lost direction. The email from Ether gave me a proper kick up the behind and I’ve taken up my pen again. Well, pencil, actually, since I’ve rediscovered a love for working through ideas with pencil and notebook. That, combined with that admiration for chapbook writers I mentioned above, has led me to a little project of my own. 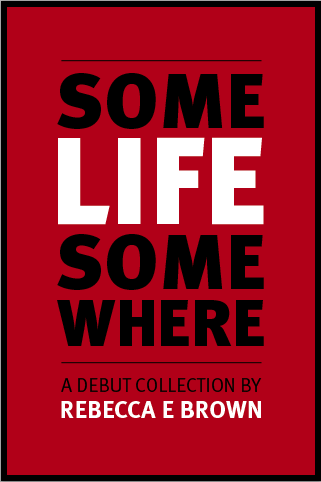 I proudly present my own e-chapbook, Some Life Somewhere. It’s a collection of seven short stories told through dialogue, and touching on the big questions – life, death and the tricky bits inbetween. I’ll be publishing it on kindle and through smashwords later this week, and I’ll put a link to the Amazon listing on here and my website and facebook page. My very talented husband has done my cover and I love it. I’m really excited about the whole thing -even if only my mum reads it, it’s me taking a big brave step and it’s what I need to do to pick my feet up and run along my own path as a writer. This is great, good luck with it. And you’re not too big for your boots at all! I can imagine it’s quite scary for you, to put yourself out there and I’ve got nothing but admiration. You’re a great writer and hopefully the responses you get from something like this will build your confidence. You should be doing this – you are a very talented writer who deserves a bigger audience. Looking forward to reading more from you. The cover looks great too. Well done, Andrew! I’ll be putting it on my kindle as soon as. I take my hat off to you. What a good idea! I really hope it goes well for you…I MUST get a kindle! Well done for taking the big step. Love the cover. Have not yet acquired a Kindle but do have Kindle reader for PC so hope to avail myself. Hi Becca, well done, that is so exciting!! I will be adding to my Kindle app on my iPod then won’t I. Three cheers. Thank you, I really appreciate your support. You’ve been cheering me on since I first dared call myself a writer! Thanks Maria! I really appreciate all your help & support 🙂 Ooh, and you should TOTALLY go and get an e-reader (my kindle is fab!) because it’s just amazing. So there 😛 Thanks! Hey Rebecca, Well done! What a great idea – and it is a great cover! It’s a beautiful cover and a great idea. Go for it! You definitely should put your writing out there for others to read and enjoy. You’re an excellent writer, Becca. Have a little faith in yourself and your ability. Happy to see you taking this leap and it’ll be on my Kindle for sure. Good luck! Oh do! It’s very exciting! Thanks for commenting! I was thinking the same thing a little on my blog, about how the epub movement is mirroring the Chapbooks renaissance. Back then, it was the printing press that revolutionized (and popularized) writing and printing books. I wonder if the ebook will have the same impact? I also believe that the medium is going to change as books move from print to digital. There are so many more things you can do with a “book” that it is inevitable, I think. 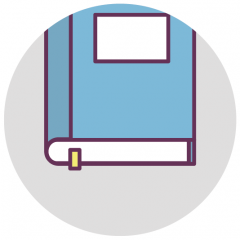 Hyperlinks, video and images, maybe even websites built right in… In 20 years, our concept of “book” will be completely different. Anyway, congrats again on your own Chapbook venture — very exciting! Thanks very much! It’s an exciting time, definitely! Thanks for telling me how to download your book. Well done, Becca you portray life as it is from the ordinary person not as some ficticious being made up in someone’s mind. Can’t wait for the next. Go girl, keep writing with your own style of warmth & humour.